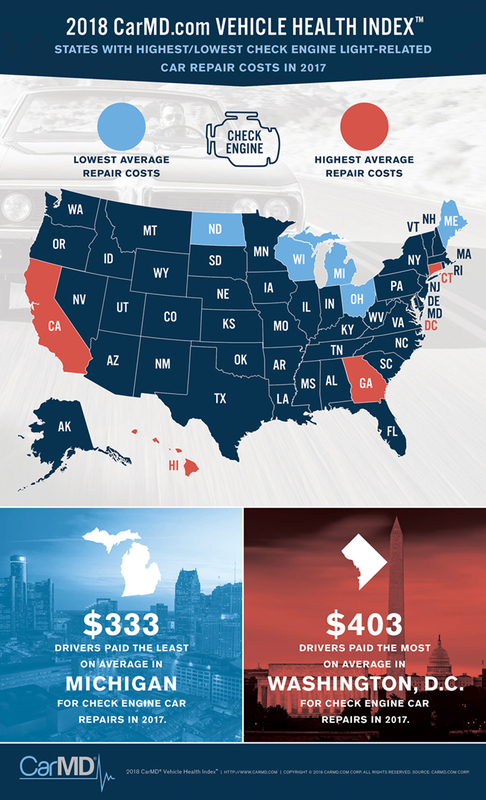 Many factors contribute to a state’s average repair costs, including type and age of vehicles, type of repairs needed, repair difficulty, length of time needed to complete the repair and repair shop hourly rates. No matter their location, some of the most beneficial things drivers can do to reduce the cost of repairs are educate themselves about their vehicle, keep up with regular maintenance, address the check engine light (or any dash light) as soon as possible, and establish a relationship with a trusted dealership or independent repair shop. CarMD publishes this annual state-by-state ranking as part of its CarMD® Vehicle Health Index™ to bring awareness about the importance of check engine light health to help reduce cost of ownership.